Selecting the correct altitude for a given peak hull temp with the Ravenstar. Before we start I'd like to thank Douglas E. Beachy and Steve "Coolhand" Tyler for creating one of the most amazing and fun to fly spacecrafts in Orbiter. Also an additional thanks to Doug for sharing a part of the Ravenstar's hull temperature code with us, without which this tutorial wouldn't be possible. One of the most important factors in a successful aerobrake/aerocapture maneuver with an XR2 is the periapsis altitude of the trajectory. Especially when you are approaching a planet with a high velocity. Too low and you'll burn up; too high and you won't get captured by the atmosphere. 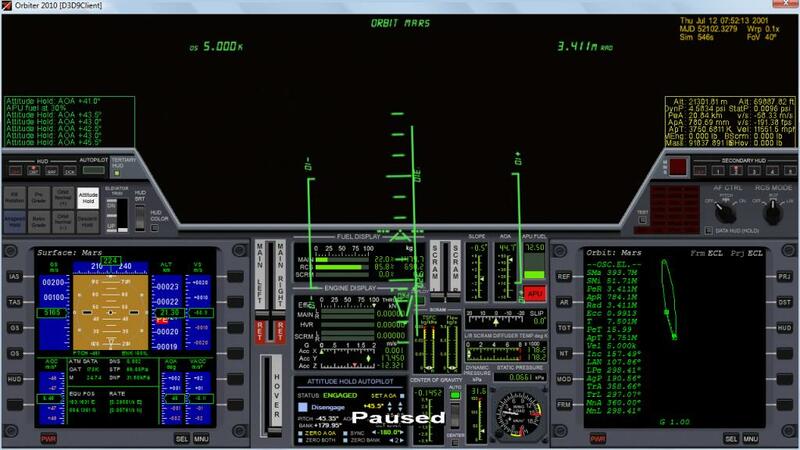 Many rely on experience to help them select the correct altitude at which to perform the aerocapture, but even the most experienced -every once in a while- come by a situation where they don't really know what to do. This tutorial will show you how to calculate in advance the lowest altitude that you can dive in an atmosphere, for a given hull temperature. [Note: effectiveOAT, "Effective Outside Air Temperature", is computed from GetAtmTemperature() from the core, but of course the affect it has on hull temperature is only a factor at all where there is enough static pressure to make any difference. The effect it has varies by static pressure. This is only for the nose hull temp, but it's the only one we need, since it's the highest temperature during an aerobrake. It is safe to assume that OAT is negligable during the initial part of the aerobrake. Earth, Venus and Mars however, have custom atmospheric models, so we need a table with the static pressure at a range of altitudes that correspond to typical reentries. -Run a scenario in Orbiter. -Bring in a DG and place it at the planet/altitude you want. -Repeat the last three steps for the range of altitudes you want. Let's re-arrange the hull temp equation to find the static pressure. The maximum nose hull temperature for the XR2 is 2840°C. I don't recommend going higher than 2500°C, since any mistake near those temperatures will result in the loss of crew and ship. All we need to know is the airspeed at periapsis, calculate the static pressure and look up the table to find the altitude. Here we need to remember that the hull temp is calculated using the airspeed, not the orbital velocity. For Venus, this doesn't pose much of a problem, since it rotates so slowly, but for Earth, you can have a difference of up to +/- 464 m/s depending on the direction of your trajectory at periapsis. 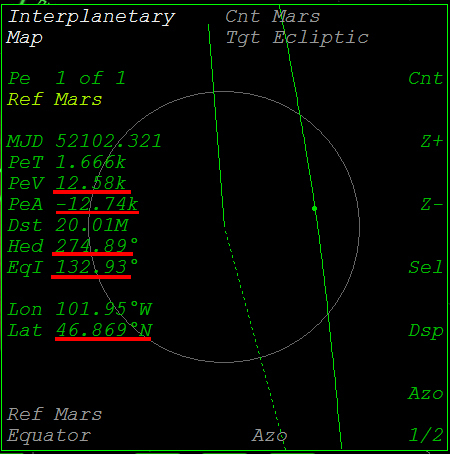 For Mars the difference can be up to +/- 240 m/s. Since the airspeed is raised to the power of 3, such an error may have a big impact in our hull temp calculation. Where PeV = the periapsis orbital velocity, EqRot = planet's rotation velocity at the equator = 2*π*Radius/siderial day, lat = geographical latitude of periapsis, heading = heading at periapsis. Venus rotates so slowly that the difference of the orbital speed and the airspeed is negligible. So enough with the theory, let's try an example. We'll use the scenario from jroly posted here. 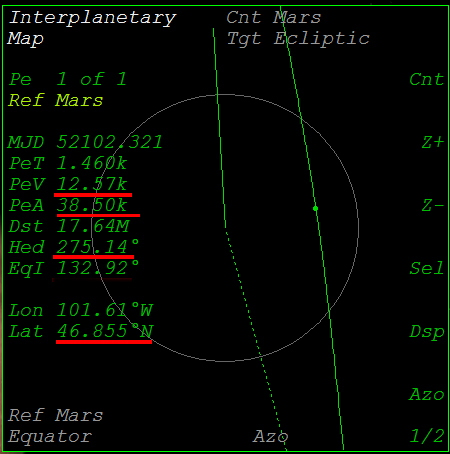 I am coming in at a high DV of 12 to mars, is it possible to aerocapture in the XR2? tried a few times and I always burn up. Is it impossible to do? Not at all. 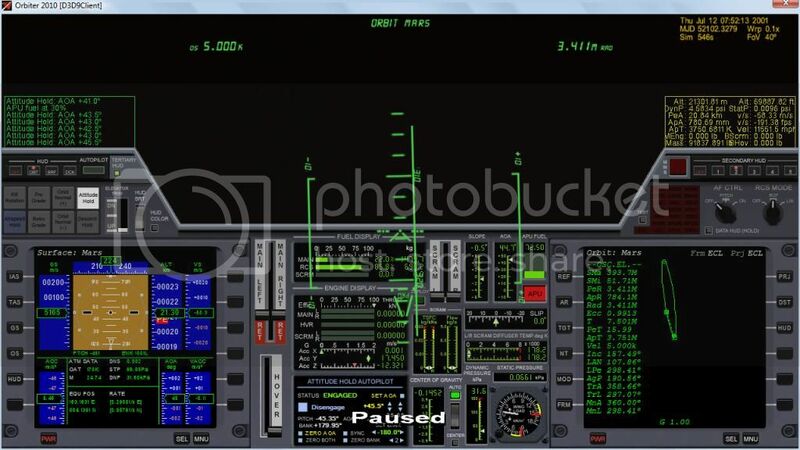 All you have to do is select the correct periapsis altitude so that you don't burn up and when you reach that altitude keep the vertical acceleration close to zero, until you have shed enough of your initial velocity, in order to get captured. 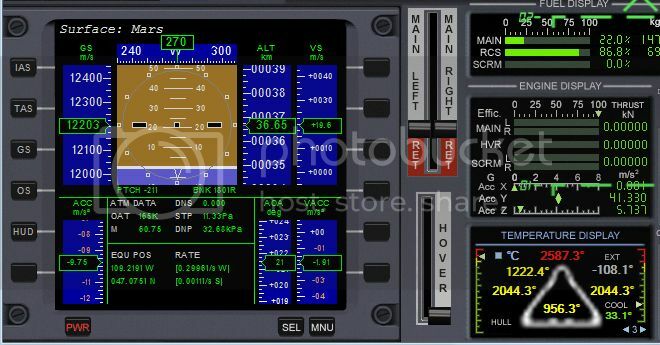 You will need to perform an inverted aerobrake so you can use the lift of the wings to stay inside the atmosphere during the time it takes to lose the horizontal velocity. 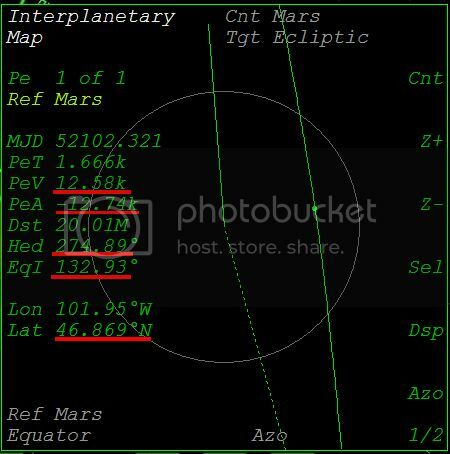 Looking up the table we can see that for Mars, that static pressure corresponds to an altitude of slightly more than 38km. So our first action is to use the RCS thrusters and set the periapsis altitude at 38.5 km. This will ensure that our peak hull temp will not be higher than 2500°C. The parameters changed a little bit, so let's redo the calculation. The difference should be small but we'll do it anyway for practise. So it's pretty much the same; there is no need to change our periapsis altitude. One thing to remember here, is that we won't instantly "pop up" inside the atmosphere at that altitude, but we'll go through the upper layers first. So our peak hull temp should be slightly less than the prediction (2500°C) for that altitude. Let's go to periapsis and check the temperature. We start inverted at ~40° AoA and watch the vertical velocity and vertical acceleration in SurfaceMFD. Our goal is to get the vertical acceleration close to zero when we reach a vertical velocity of zero at periapsis. To do that, we'll start lowering the AoA (while inverted) when the vertical velocity is about -300 m/s. Seems like we slightly overshot the periapsis. That's ok, by calculating the periapsis altitude for a hull temp of 2500°C we can afford to make such small mistakes, by giving ourselves a couple of hundred degrees room for error. Now all we need to do is hold this altitude (and drop lower as the airspeed decreases) until we are captured. This link will get you to a google spreadsheet that makes the hull temp calculation, so all you have to do is enter the variables from IMFD's Map program and you'll get the static pressure of the lowest altitude you can dive in for a given temperature. It's been preset to 2500°C, but you can change it if you want. When you go to the link, select File→Create Copy so you can keep your own copy of the spreadsheet. Otherwise you won't be able to use/edit it. One last thing to keep in mind, is that this calculation will only tell you the altutude at which you can dive inside a planet's atmosphere for a given peak hull temp. Whether you can actually perform an aerocapture at that altitude depends on other factors as well. Last edited by dgatsoulis; 06-18-2014 at 10:16 PM. Reason: Typo, thanks Ripley! thanks for the tutorial on hull temps at different altitudes! I reckon now if we can plot the maximum altitude needed to maintain hyperbolic orbit within the atmosphere vs the temperature suffered at those altitudes you/we can know what kind of approaches are and are not viable to certain celestial bodies. Naturally this is limited by the maximum amount of lift a spacecraft (lets say the XR2) can sustain before breaking apart due to excessive wing load and maximum temperatures by aerodynamic heat flux. Fortunately wing load will not get near critical until after 50m/s Y-axis acceleration and this is enough to stay in inverted atmospheric hyperbolic orbits around celestial bodies with atmospheres. Hope this won't count as resurrecting an old thread. I found this post super interesting, but photobucket took a dump on the pictures, so here they are again from archive.org. It might be more useful to edit the original post. Ok, we are less than 1/2 hour from periapsis, the periapsis alt is 12.74 km below the surface (we'll fix that) and the PeV is 12.58 km/s. To do that, we'll start lowering the AoA (while inverted) when the vertical velocity is about -300 m/s. Seems like we slightly overshot the periapsis.